A well-managed paddock. Photo courtesy of the Kentucky Horse Park. Sound pasture management makes good sense for the bottom line of any farm or ranch. Effective management can double total forage production, making for happier, healthier horses and lower costs for farmers and ranchers. Well-managed pastures provide ground cover, prevent soil erosion, and decrease barnyard runoff. They require minimal pesticides and fertilizers, making them lower-impact than other crop covers. Healthy pastures also provide habitat for a range of birds and wildlife. It can be daunting to take on the task of developing a pasture management strategy. The good news is that an effective pasture management plan can be completed in eight simple steps. Think of fertilizer and lime as nutritional supplements for the pasture grasses that will nourish your horses. Over time, plants draw nutrients out of soil. In a natural cycle, enough dead leaves, manure and other biomass feed the ground to meet, in conjunction with a seasonal rest cycle, the nutritional needs of a pasture. However, regular usage and nearby changes in the landscape – including runoff from impermeable surfaces such as roadways, buildings and parking lots and associated plant removal causing loss of good topsoil – mean that we need to help the nutritional cycle along. Before you add nutrients to your pasture, it is important to identify what it needs. You can use a simple coring tool to take your own samples and your local soil conservation district or agricultural extension office can analyze your samples at very low cost (usually $10 or less per sample). It does not matter when in the year you take the samples, though soils should not be saturated. But, do take your samples in for testing at the same time every year. Taking soil samples is easy. Samples can be taken to your nearest soil conservation or ag extension office for testing. Photo courtesy of the University of Missouri Extension. Based on the results of the soil samples, select a fertilizer to use. Fertilizer should be spread in the fall of the year, as the grass goes dormant. This will ensure that the root system strengthens and deepens, making for a better, more durable pasture in the spring. Fertilizer should be applied annually, with the formulation adapted in response to that year’s soil sample. Liming is typically required every one to three years, depending on your soil conditions. Lime can be applied at any time of the year, but is commonly applied in spring due to availability of moisture. Pastures should be aerated prior to liming to help absorption into the soil. Your soil test will tell you how much lime you should apply. As a rule, you should never apply more than two tons per acre because lime does not absorb the same way fertilizers do. As a result, excess lime washes away, meaning money down the drain. One of the most important things you can do to maintain your pastures is to keep them well-covered in grass. While we cannot control weather related influences on ground cover, we can control the burden our horses put on the pasture. The table below outlines how much grazing per day a pasture of a particular size can sustain and still maintain 70 percent of its grass cover. This standard is for temperate climates and should be adjusted based on the particular climate, seasonal variations and specific weather patterns. Keeping grasses trimmed will ensure that new growth is tender, nutritious and appetizing for horses. Cutting off overgrown and dead tops will improve root growth, lower fire risk and increase the longevity of your pastures. Adding new seed to pastures is important to maintaining the health and stability of your turf grasses. Pastures should be harrowed before you seed to ensure that your investment in seed has the best chance of success. Soil conditions may allow for broadcasting or require drill seeding for good germination. Check with your soil conservation district or agricultural extension office to get recommendations on the best grasses to plant for your pasture and region. Once your turf is well established, dragging your fields will break up and distribute manure, ensuring a healthier pasture by distributing the nutrients in manure piles and encouraging even grazing. Breaking up manure piles also destroys eggs and larvae from parasites, preventing other costly issues inside the barn. Regular usage causes soil to -become tamped down and hardened (compacted). Aerating the soil to reduce compaction will give your grass a better chance to grow and thrive. Some weeds and even poorly managed turf grasses can pose hazards to horses. Your local agricultural extension office can help you determine a cost-effective, horse-friendly strategy for managing weeds in your pastures. Early action pays off! 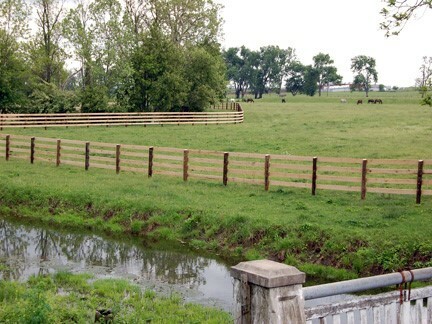 Fence used for stream protection. Photo courtesy of University of Kentucky. Many of us are fortunate to have rare and delicate natural areas on our property. While these areas afford us the opportunity to see rare birds or to safeguard a natural treasure, we also need to integrate them into pasture management strategies. Sensitive areas should be fenced off into no-go zones. Many communities offer financial assistance for safeguarding these important areas. A little time and a bit of consultation will go a long way to creating an effective pasture management strategy for your farm or ranch. Please reach out to your local soil conservation or agricultural extension office to get started on yours today!